Despite calling his return "rusty," Lakers coach Mike D'Antoni said Jordan Farmar made a big difference for the team offensively. Missing a month and coming back against the two-time defending champion Miami Heat is no short order. Such is the life of Lakers point guard Jordan Farmar. His return to the lineup was a welcome sight for the team that was without a point guard in its previous seven games. Thrust into the starting lineup, Farmar played 33 minutes in the 101-95 loss. As expected there was plenty of visible rust. The stunting and trapping done by the Heat defensively didn’t do him any favors. "They take away the screen-and-roll right away," said Farmar, who committed four turnovers in the loss. "There’s not a lot of penetrating, getting to the paint, and making plays. They trap (the screen-and-roll)." Overall, however, the offense flowed better with the team actually having a point guard at the controls. "It’s a big difference," D’Antoni said of the offense with Farmar being in the lineup. The Lakers hoisted 36 shots from three-point range, which was by design. As a team they connected on 14 of them. The byproduct, D’Antoni says, was better ball movement and spacing thanks to Farmar being back. "That’s my job," he said. "Get the ball in people’s hands where they can be successful. Get X (Xavier Henry) back to slashing and getting to the basket. Get Nick (Young) into his stuff. Feed the ball to Pau (Gasol) and then pick my spots. If I could’ve done that and I would have contributed offensively I think we would’ve been right there playing for the win at the end of the game." The 32 game minutes was the most five-on-five action Farmar has seen since injuring his hamstring on Dec. 1. In the limited time he had on the court before his return to the lineup, he played three-on-three "just to test out my hamstring." I’ll start getting in the paint and making plays for myself and the team. Throughout the loss to Miami, the hamstring injury was on the mind of Farmar and he says prevented him from exploding for fear of reinjuring it. The Heat made it tough with the way they were able to defend, but going forward the next step for Farmar as he tries to get back into a game rhythm will be to put pressure on opposing defenses by attacking. 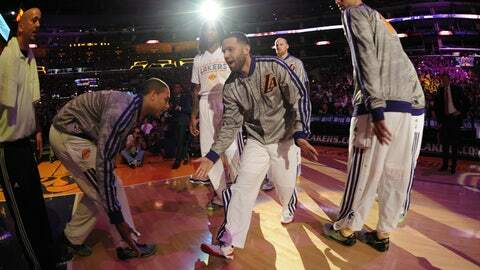 "I’ll start getting in the paint and making plays for myself and the team," Farmar said. "I’ll gain more and more confidence in (my hamstring) and hopefully it’ll just get out of my mind and I’ll be able to play."